Introducing the Auburn AUghts, the WBE series looking back at the decade that was in Auburn Tiger football. We’re starting today with the top 15 plays of the last 10 years and will continue over the next 2-3 weeks with lists of various sizes and a couple of columns dedicated to the Auburn teams, players, games, coaches, and more that made the AUghts one of Auburn’s strongest decades in its 100-plus years of football. Enjoy. Yes, he figures prominently. I know you're surprised. Selecting a list of “top plays” is tougher than you might think. What’s the criteria? Do you go with the most athletically dazzling? The most historically important? The most purely memorable? The ones that showcased Auburn’s brightest stars at their best? In the end, I tried to include all of those kinds of considerations–but also, finally, just went with what plays felt the biggest, the ones that defined Auburn’s decade. I’m expecting you to disagree and in many cases I’m expecting you’ll be right; feel free to add your submissions/arguments/insults in the comments. It’s my contention that every team that goes undefeated–certainly so in the SEC–has one play they can look back at, one play to point to, where nothing that happens afterward happens without it. For Auburn 2004, nothing–not the touchdown that followed it, not the undefeated season, not the SEC title, not the Sugar Bowl championship, nothing–happens unless Jason Campbell maneuvers just enough in the pocket to find Courtney Taylor for 13 yards on 4th-and-12 on the decisive drive against LSU. It’s a pretty remarkable play, given how much pressure Campbell was under and how precise Taylor’s route-running was. But it’s the remarkable-ness that this play made possible are that drives me to put it at No. 1. People said a lot of things about Brandon Cox during his three years at the helm of Auburn’s offense. But “chokes in the clutch” was never one of them, and this pass to Devin Aromashodu–last drive of the game, 4th-and-10, between the hedges–was Cox at his absolute most clutch. Auburn’s had some big fourth quarter plays and won some big games since then, but a big offensive play this late to win a game this big? Hasn’t happened. It was just three seasons ago, but I think after Auburn’s strong finish the 2007 season and 2008’s misery, we forget how gawdawful the start to 2007 was. The Tigers had been lucky just to take South Florida to overtime, they’d lost to Miss. St. at home, Cox had been benched, New Mexico Freaking State had held a first-half lead–the lowest single point in the Tuberville tenure to-date, easily–before Auburn had recovered in that game and gone off to the Swamp as 17-point underdogs. To kick a game-winning last-second field goal at Florida Field once shows some serious stones. To do it twice … I mean, we’re talking grapefruit-sized, folks. Not sure if Bramlett’s ever going to top it. I still don’t know how the hell he knew it was good. Remember: that kick came in some serious wind-and-rain conditions. Tubby reminisces about it here. Cheating a little bit to get two plays in one spot on the list? Maybe, but when one guy makes two pivotal, historic plays four years apart with not a whole lot in-between, I think it makes sense. The first came on Auburn’ second drive of the 2002 Iron Bowl, a 51-yard What the hell?!?! play that announced–clear as a bell–that Auburn could give a crap about not having Ronnie or Cadillac; they were there to win the damn game. It’s still the most memorable play of the biggest win of 2002 … and there in 2006, here’s Smith again, somersaulting into the end zone after a killer punt block that spurred Auburn to their biggest win of 2006. The best part of that second play? Well, besides the whole “beating Florida” thing? TheAuburner immortalizing it like so. That play broke open what had been a tight game and produced a comfortable 34-17 Auburn win, setting the Tigers up for their run the 2000 SEC West title. 8. Quentin Groves seals it, vs. Kansas St. 2007. Speaking of fast, it’s not often I’ve felt as sorry for an opposing player as I felt for Kansas State left tackle Alesana Alesana, who had the unenviable task of trying to contain a fully healthy ears-pinned-back Quentin Groves at the end of Auburn’s season-opener vs. the Wildcats in ’07. It did not end well for Alesana, as you’ll no doubt recall. The first and–I’ll go ahead and provide a spoiler here–only play on this list from an Auburn defeat, Karlos Dansby’s ridiculous hook-and-ladder co-interception with Dontarrious Thomas ended up not doing much to change the outcome of the game (a 16-10 Tar Heel win) or the foul taste of the end of Auburn’s season. But no play from Auburn’s last 10 years has been more supremely athletic or so immediately SportsCenter worthy. Because this play never could have happened without the first play on this list, I tend to think the first one is the bigger, better play of the two. But of course, by the same coin, that first one has long since been forgotten if Campbell and Taylor don’t hook up for the game-winning touchdown just a few seconds later. It feels a little on the wrong side including two plays from the same game in the top 10, much less in the same drive … but we are talking about the biggest drive in the biggest game of the biggest season of Auburn’s decade, right? So yeah, I think it’s justified. I hadn’t expected to care about the outcome of Auburn’s bowl appearance in ’07; with Saban’s bunch seen off, I just wanted to see some life from Tony Franklin’s new offense and get some optimism going into ’08. Then the game started, and everything seemed to click, but Brandon had his last, final Evil Brandon moment, but Auburn was still right there, and by the game went into overtime it felt every bit as much a matter of life and death as any other Auburn game. Meaning that Kodi Burns’s winding game-winning TD run was, yes, that thrilling and that big a deal … even if the Franklin-based promises it helped spawn ended up as empty as the cold, black void of outer space. If the LSU victory was the 2004 juggernaut’s most important win, the strangling of the Dawgs was its trademark victory, and for my money the most pivotal, surprising, exciting, best play of that game was Cadillac pulling up and firing a pinpoint pass to an open Anthony Mix to put Auburn up two TDs. They never even came close to looking back after that. It was one of the most delightful trends of the decade: Auburn running backs running slap over Tennessee defenders. And even if you tell me that two plays doesn’t make a trend, well, two plays this good damn sure do in my book. For the Tate vs. Berry clock-cleaning, click here. Correct call or not (you know where I stand), if Eric Brock doesn’t come over and deflect Jamarcus Russell’s pass, LSU keeps the ball and very likely sneaks out with a win. In a game packed to the absolute gills with standout defensive plays on both sides, this was the play that stood out the most. And finally, we come to a play I can’t find a clip for. Auburn’s 24-17 victory over Georgia in Mark Richt’s first season is memorable primarily for Cadillac’s herculean 41-carry, 167-yard effort, but the game’s critical play was its final one. The Dawgs were on the Auburn 1 with precious few seconds remaining and no timeouts when Richt called for a run with powerback Jasper Sanks. Spencer Johnson and a host of Auburn defenders stacked up Sanks at the line, time ran out, and that was that. If Richt’s brainfart in calling for a run is probably what most non-Auburn oberservers remember first about the play, what shouldn’t be forgotten by Tiger fans is that this was the Auburn defense’s biggest goalline play of the decade. Rudi Johnson’s 70-yard touchdown run vs Wyoming in 2000; Kenny Irons’ breaking free against LSU in 2005; Walt McFadden‘s tightrope pick-six vs. Ole Miss in 2009; Quentin Groves‘ twin sack-and-strips to set up Auburn TDs vs. Alabama in 2006; Jerraud Powers‘ end-zone interception vs. Alabama in 2007; Damon Duval‘s game-winning field goal vs. Miss. St., a week before the Florida game in 2001. 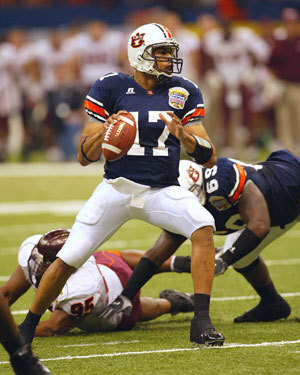 — In another 1-2 punch of plays, there’s Jason Campbell hitting Devin Aromashodu for 53 yards to give Auburn the lead for good in the 2004 SEC title game, then finding Ben Obomanu for 43 yards in the fourth to clinch it. Just in case you’ve forgotten (I feel like I kind of had): Campbell went 27-of-35 for 374 yards in that game with 57 yards rushing for good measure, for a total of–get this–431 total yards. Whoa. — Bret Eddins just burying Jamarcus Russell in that 2004 LSU meeting, the game that keeps on giving on this list. — Tray Blackmon forcing Chris Leak’s fumble–hell yes it was a fumble, there’s no damn Tuck Rule in college football–inside the Auburn 10 to help keep the blocked-punt tide turning vs. Florida in 2006. — Lastly, just a note to those of you wondering where “The Hit” from 2004 is: it’s been left off on purpose. It’s the most memorable, maybe even “defining” play from that indestructible 2004 D, but I can’t bring myself to celebrate any play that leaves a player lying motionless on the field for 10 minutes. Sorry. Great review, Jerry. Some of my best memories are calling my Gator brother (who transferred after two quarters at Auburn) after those wonderful AU-UF wins to rub salt in his wounds. “Never lost to Tebow, never lost to Emmit” is still a favorite line. War Damn Eagle. Thanks for the memories. Forgot about that Dansby play against UNC. Great list and fun to think back on these. Surprised to see only one 2009 play? Which one was the first this year that made you think that spread eagle 2.0 might work? That one should get a mention at least, though it is hard to remove any of the plays on your list. as far as single plays go, I’d at least include the junior rosegreen – reggie brown hit. while not piviotal, it is still epic. It’s hard for me to argue with #1 given the context of the 2004 season. However, Caddy’s run in 2003 was easily one of the most memorable plays for me. The whole setup made it. The fact that the 2003 was terribly disappointing. Add to that Caddy’s Iron Bowl history to that point was non-existent due to injuries. Finally throw in the, umm, whispers that were going around that week. Then he takes the ball makes that juke to the right and is gone into history. The stadium explodes and you’re right, no one doubts who will win the game. And, hey, since you are getting transitive with #1, technically 2004 doesn’t happen without that Iron Bowl win. Thanks for the trip down memory lane, but man I’m really dreading the worst losses column. AUcory, I thought about including the Rosegreen hit because I know it’s probably the most single notable play the ’04 defense made, but man, watching Brown fall like a pile of bricks gives me no joy. I don’t blame Rosegreen or anything, but it’s just not a play I enjoy watching or thinking about. Beef, the Zachery TD vs. La. Tech maybe should have been honorable mention, or the Fannin TD vs. WVU. But I had a hard time picking one play to represent 2009 … thought McFadden’s pick was the best combination of importance and skill. Sean, I wouldn’t argue with moving Cadillac to No. 2, for all the reasons you mention … but I think the 2004 team has to have No. 1. OMG Jerry, I’m so glad I’m not the only one who thinks that 4th and 12 play was the Play of the Decade for the Tigers. The tension leading up to that play is what makes it stand out in my memory, watching people find a way to pace in place at JHS during that timeout, you just knew the season was on the line. Combined with the fact that Campbell took the hit like a champ-and-a-half and Courtney making the catch with a defender draped all over him, that play was just plain EPIC. One more thing then I’ll shut up; are none of the Campbell plays from the SECCG not worthy? That bomb to Devin in the 3rd wins us the SEC Championship IMHO. Thanks for the vids! Excited about the rest of the AUghts lists. WDE! Chris, the play to Aromashodu absolutely should have been up there somewhere. Or one of the TD passes in the Sugar. Or the one to clinch the Iron Bowl. That’s the problem–Campbell made so many clutch.key TD passes that season none of them really stand out other than the LSU one to Taylor. But I should have picked one. For a “sportcenter-worthy” type play, I’d nominate Cadillac’s complete juking of UT DB Jonathan Wade in the flat in the 2004 SECCG. I like the picks jerry, good job. Anyone else read the article over at Team Speed Kills “The Rise and Fall of Auburn”? JBoggs, which play are you mentioning? If you’re talking about his forced-fumble of Leak inside the Auburn 10, that was at J-Hare. I thought about it … but the blocked punt was bigger, I thought. AE, the Duval fake was in ’99. Yeah, that’s the one -thought for sure that was at UF-guess not. I have a few Gators for friends and they still aren’t willing to consider that as a fumble. A big play that breaks a rivals heart and sticks in their craw should get special “juice” in my book. Fun list though. Tre Smith in the Iron Bowl was something special-especially since just about everyone had written it off. What about “The Hit” against Georgia in 2004? annnnnddd…nevermind- I saw two clips and assumed one was the RB run and that the other was CAddy. I’m going back to my corner now. Nothing from the 2006 Florida game? The blocked punt perhaps? Great list. Agree on the Rosegreen hit due to it’s nature. Another great goal line play that perhaps is forgotten is the one Thorpe Award Winner Carlos Rogers made on the Va. Tech QB in the Sugar. Flipped that sucker end over end! Loved that! Brett Eddins’ sack of the LSU QB in 2004 should also garner at least honorable mention – it was a thing of beauty. One of my favorites was the final play (really second to last play, but I don’t count taking a knee) of the 2007 Iron Bowl. It was 4th and 1 on Bama’s 30. Bama would have a chance to score and tie the game if Auburn didn’t make it. Lester gets the ball and drives back nearly the entire Bama defense for a 12 yard gain. He just kept chopping his feet and driving forward. Beautiful. Michael: You might be Wright about that. Wright was a blur. Hard to call. Should have limited it to this decade, I guess. The Eddins sack was on Marcus Randall not Jamarcus Russell. I would have to say THE trademark victory of 2004 was the Tennessee game. I remember watching that game and saying, “Man, we’re really good this year.” Before that, I wasn’t really sure, but after Ronnie Brown ran over Jason Allen at the goaline – I just knew we were in for something special. I would like to see Stanley McClover’s last sack of poor Brodie Croyle in 2005 added to the list. When he just stands over him like a Spartan in 300, and Croyle starts crying. The Sack-a-palooza sure was fun. Are you going to do a most important “players” list of the ’00’s ? I also submit sacks 1-11 in the 2005 Iron Bowl. Honk if you sacked Brodie!!! P94, thanks. Dammit. Andy es, there’s going to be lists of players, games, off-field developments, gut-punches, a Tubby retrospective, maybe something else I’m forgetting. There should be some mention of the “Honk” sacks, agreed. Wasn’t sure whether to try and pick one out or honor them collectively, though.